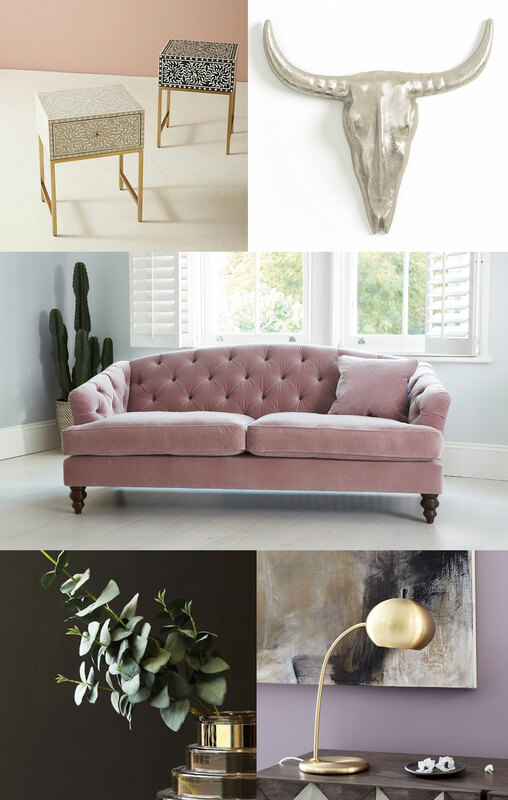 You know styling moodboard posts are my absolute favourite thing to create, so today I’m super excited to be teaming up with the Darlings of Chelsea team to show you how to style your sofa four different ways. Darlings of Chelsea, if you’re unfamiliar, is a luxury British sofa brand which manufactures the majority of its collection here in the UK. Craftsmanship is at the heart of the company, and with a whole host of customisation options for each chair, sofa and bed, you’re able to create something that will set you apart from the Jones’ next door. 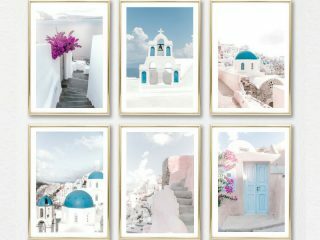 With that said, I went on to the website – which is easy to navigate by the way, including large images and reams of fabric choices etc – and managed to whittle down four of my favourite styles. I wanted to create a different finish for each sofa, and even though it’s hard to pick a favourite I think the bottom sofa, Paisley, captured my heart from the beginning – although it has to be said, the goth inside me fell in love with this black velvet number below as soon as I laid eyes on it. And as Darlings of Chelsea founder John Darling explains, this is one texture to watch for 2018. 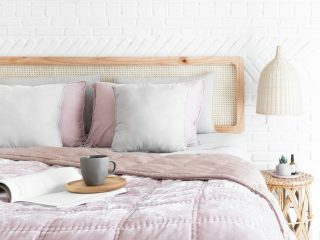 “In terms of trends for the new season, we’re seeing a big push towards velvets – coupled with big deep comfy corners. The deeper the better it seems at the moment – like our Haymarket Extra deep corner sofa,” he adds. 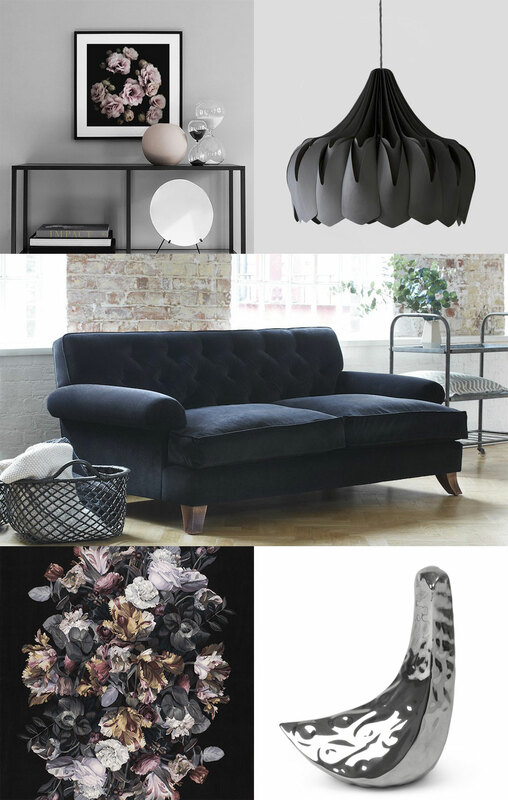 I knew as soon as I saw the black velvet Heartwood sofa it needed to be juxtaposed with a feminine feel, including dark blooms and curves. 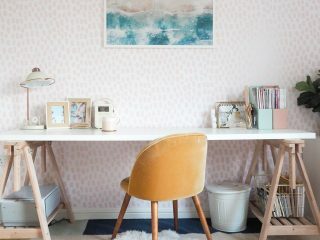 I love the floral print on both the wall art and the most amazing rug designed by Alexander McQueen. Velvet has such a luxe finish to it and it suits this style perfectly, especially by adding in sculptures like this Jonathan Alder ceramic bird and statement lighting from Be & Liv. 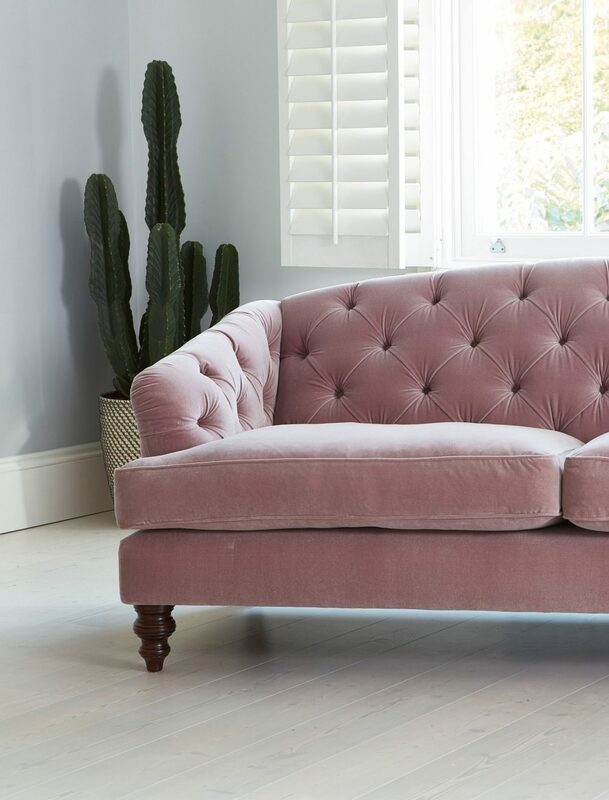 Handcrafted in the UK, the sofa itself is the perfect combination of classic and modern design, with traditional deep buttoning on the back, pleating detail to the arms and feather cushions. The Kali sofa is a striking design, not only thanks to its vibrant mint shade but its contemporary shape. 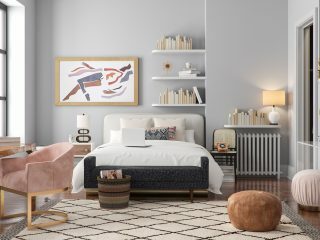 From the curves of the arms to the Scandi style legs, I wanted to create a modern feel to this room but with a retro finish. 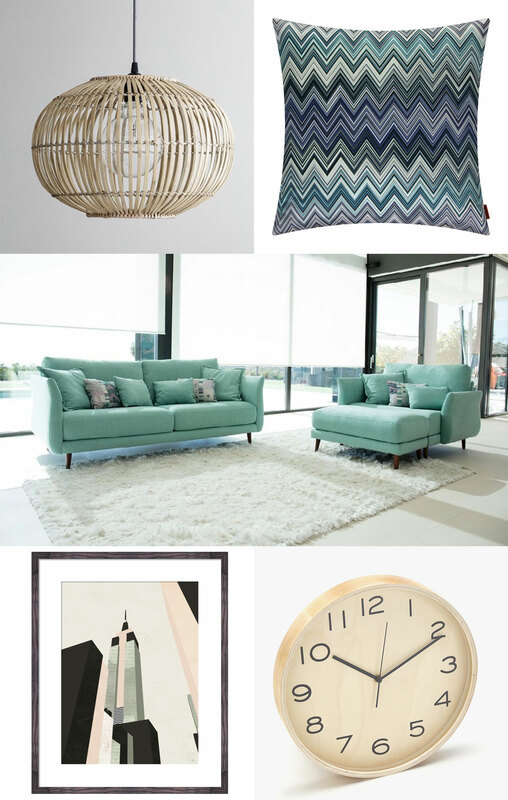 Natural woods suits the Kali perfectly so the Zara Home clock and bamboo light fitting from Grace & Glory work really well, while the geometric print of the Missoni cushions plays off the geometric silhouette of the sofa. This range includes a number of modular units so you can build a corner sofa that fits your ideal living space. 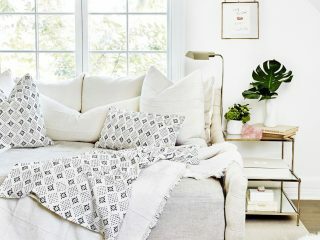 Although I love nothing better than a colourful statement sofa, sometimes a classic neutral is all a room really needs. The Morellia combines traditional style with comfort, featuring a generous depth and scatter cushions that come as standard, meaning you’re able to kick your shoes off and really stretch out for the evening. Even though a neutral shade like this isn’t the most family-friendly, the L-shape really lends itself to Sunday afternoon watching films with the whole family laid out. I wanted to keep this room very rustic, hence the textured throw, artisan crockery to eat popcorn from and a woven basket to store magazines at the side of the sofa with. 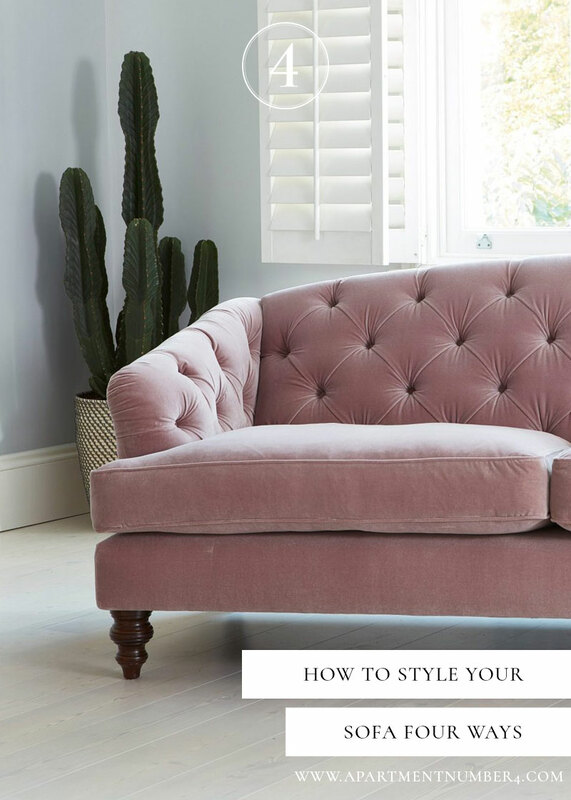 I feel like it’s pretty obvious why I chose the Paisley Midi sofa when showing you how to style your sofa – hello blush pink velvet. This Chesterfield is exclusively available at Darlings of Chelsea in a huge range of fabrics, although I honestly couldn’t imagine a more perfect pairing than this right now. The classic design with its deep buttoning along the curve of the back is handcrafted in the UK. 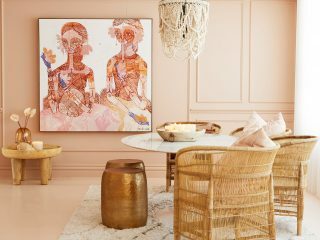 To create a polished bohemian look I’ve added gold accessories, faux botanicals and the most amazing side table from Anthropologie. 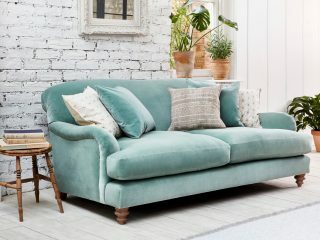 The petite size of this sofa is ideal for those with limited space but still looking for maximum style points, and I have to say out of all the above, this is my absolute favourite. Which is your favourite style from the four above? If you had to choose one, which would it be? 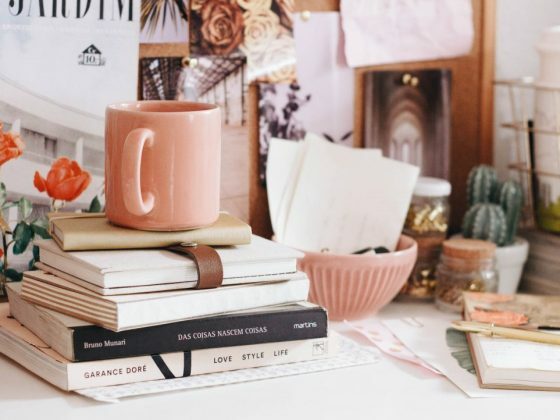 Be sure to check out Darlings of Chelsea if you’re in the market for an investment piece of furniture, because with the price tag comes amazing, long-lasting quality and British craftsmanship. With four showrooms across the UK, including Birmingham, Fulham, Surrey and St Albans, you don’t just have to rely on the power of the internet to find your perfect sofa. 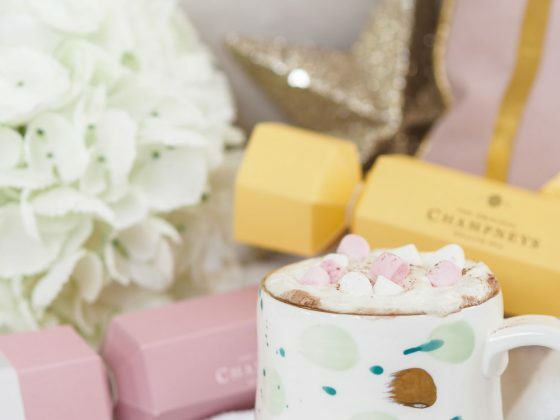 *Post in partnership with Darlings of Chelsea, but opinions, styling decisions and love of Parisian inspired sofas all my own. 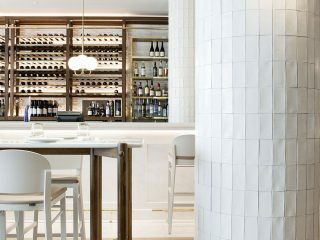 The Luxe Heartwood! What a handsome piece! I’m loving the Parisian midi sofa. Stunning. 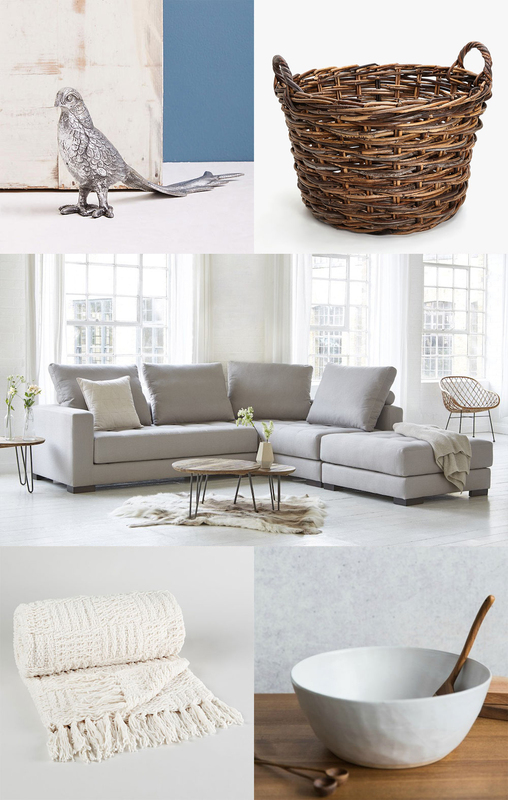 The Morellia corner sofa design is gorgeous – minimal but cosy with that braided basket and throw. Great designs!